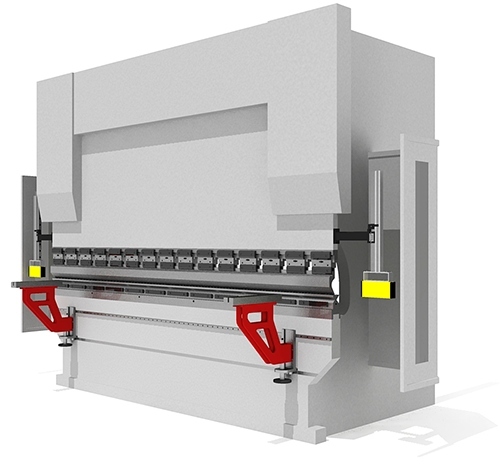 Press brake frontal table (or support table, or frontal arm, or support arm) is generally the structured guide at the front area of the machine. The main purpose for frontal table is to support the sheet metal before the bend. In generally standard press brake has at least 2 frontal tables to support from both sides of the part. Usually frontal table is the big assistance for operator because for big or heavy sheets it is completely impossible to hold by hands. The tables could have the different surface configuration, for example flat or angeled to position the rectangle sheets with side stops. The tables are connected to the side of main table. Typical frontal table is adjusted manually with the hand wheels, screws or handles according to the bending length and the height because the surface of the table should be equal to the top position of the die. Mainly because of typical operations, dies are not changed during the manufacture (bending) of the part the operator usually makes the adjustment only before the start of cycle. But for some special applications the manufacturers provide the optional additions such as motorized tables. The special tables could be also have the following options i.e. the follow of the part during the bend with the movement up and tilting for part support. This option (it could be named also frontal sheet follower or lifter) is basically NC or CNC controller and is used first of all for heavy application where the additional support is necessary because of the weight. 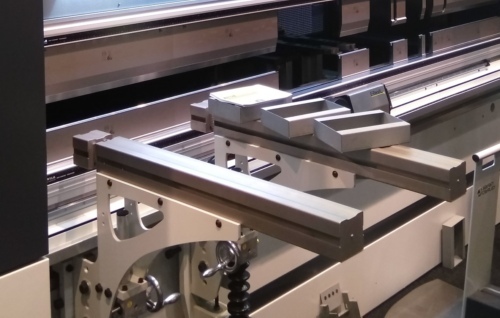 Frontal tables could be also equipped with sliding rails to extend the support length if necessary, brushes or other anti-scratch materials to prevent the defects of the surface of the sheet metal during the positioning, gauges and scales to show to the operator some positioning values etc.